I was in New York last weekend and had a great time. I met up with college friends, high school friends, and made some new acquaintances. My friend Carolyn and I took a beautiful long walk along the new High Line park on Manhattan's west side. When I was last in New York in March I wasn't able to check out the High Line because of the weather; I was really excited to do so with Caro. The park is very cool -- it's an old, elevated rail line which has been refurbished into a walkable stretch of land. The park has ambitious expansion plans and will continue construction. Check out the High Line's official site here for more details. While the weather was great, we were both in need of a cool-down treat after our walk and picked up some Blackwell's Organic gelato. 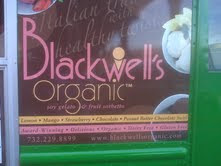 I was excited to see that the Blackwell's truck was prominently marked "Gluten Free" on its side. We both opted for a scoop of the mint chip and it was delicious! If you're walking by the High Line and need a refreshing gluten free treat, definitely check this place out. We picked it up from a truck parked near Washington Street and Gansevoort Street -- I'm not sure whether the truck moves locations. Check the company's website here for more information about purchasing the goods! 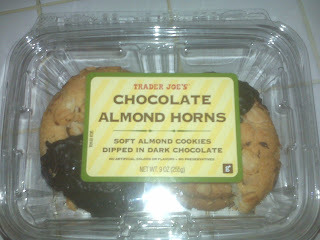 I absolute love Bakery on Main's products. They recently sent me some granola to try out, and as usual it was finished pretty quickly. 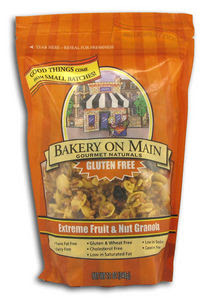 Bakery on Main has a great selection of gluten free products available. The snack size granola is great for traveling Celiacs (or people who keep a gluten free diet) as you won't have to deal with having the entire bag of granola on you. Before being diagnosed with Celiac I had never eaten granola, so I can't compare the taste of Bakery on Main's granola product with what a "real" granola tastes like, but for a quick on-the-go snack for Celiacs, it's hard to beat Bakery on Main's delicious products. Admittedly, I have yet to try Bakery on Main's "Fiber Power Granola." I'm really hesitant because, although the company uses gluten free oats, I've never eaten gluten free oats. I'm terrified of a reaction to them! This is not specific to Bakery on Main -- I haven't eaten any gluten free oats. For that reason, I can't personally recommend Bakery on Main's "Fiber Power" line. If you're Celiac, tried the "Fiber Power," and had success, please leave a comment! You may inspire me to try it. Check it out -- The Daily Beast has posted a two page article on celebrities and their penchant for the gluten free diet. The article mentions Zooey Deschanel, Gwyneth Paltrow, and other celebrities who have adhered to the gluten free diet. It also mentions my personal favorite Erin McKenna of Babycakes. 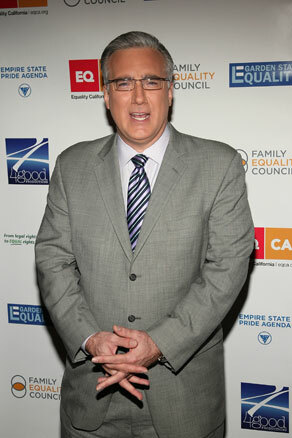 I had also forgotten that Keith Olbermann has Celiac Disease. I enjoyed reading the article, particularly the section which questioned the rising prevalence of Celiac Disease. Having just read "Eating Animals," I'm curious to learn more more about the correlation between the antibiotics we put into our bodies through animal products and the enormous increase in allergies. Just yesterday my co-worker told me that his niece is so deathly allergic to peanuts that she can't be in a room if it has not yet been properly sanitized to be free of all peanut residue. I can't even imagine how difficult that girl's life will be, and it makes me question the choices we make everyday when we decide what to eat. Check out the article and give me your feedback. Were you annoyed to see the gluten free diet described as a new star trend or are you a believer in any press being good press? Chelsea Clinton had a gluten free wedding cake at her nuptials this past weekend. The dessert was made by La Tulipe Desserts of Westchester County (in upstate New York). 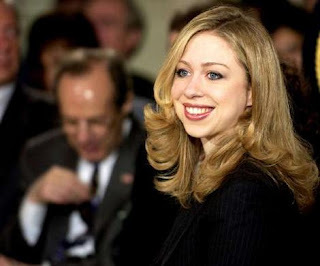 According to some internet reports, Chelsea Clinton is a vegetarian and also has a gluten allergy. For more information about the wedding, check out Gawker's round up here.